It is such a treat just to relax on the patio and watch the sunset with a light breeze gently embracing you after a taxing hot summer day. Until the breeze becomes a hurricane force wind driving you to trip over your own feet chasing your patio furniture across the lawn or even down the block! Thankfully there are a few things you can do to help prevent this disaster. First and foremost all outdoor furniture is not created equal. Do your research and know your needs before investing in your outdoor furniture set. If you live in an area known for high winds you may want to take the initiative to purchase furniture with a little weight to it. We recommend cast iron, steel or wood furniture-cast aluminum, resin wood. The heavy weight of these frames will naturally keep them more in place than their lighter weighted counterparts. Although there are some negative aspects to be considered. It may be a challenge if you are prone to moving your furniture around to use in other areas during the in season. 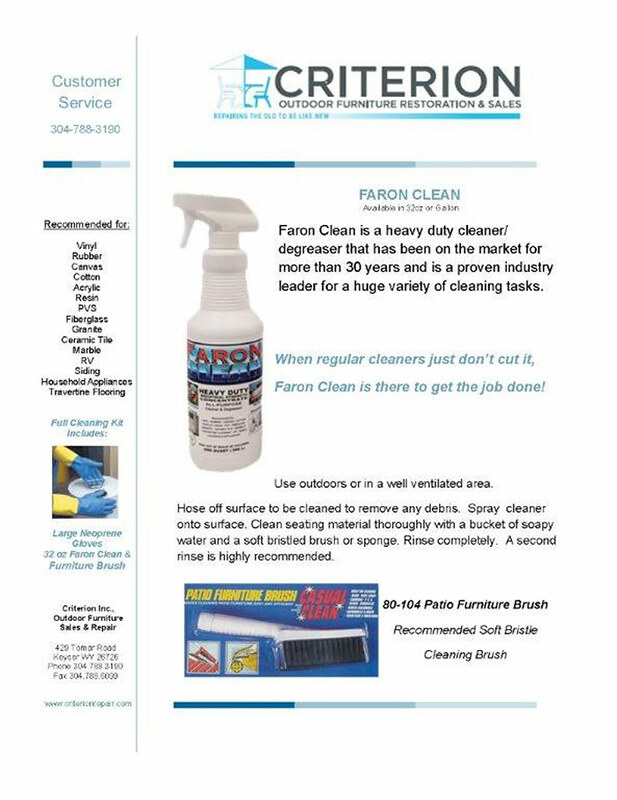 Iron or Steel furniture is also known to stain patio surfaces or decks to help prevent this, you will need to regularly check and replace all damaged, broken or missing foot glides. 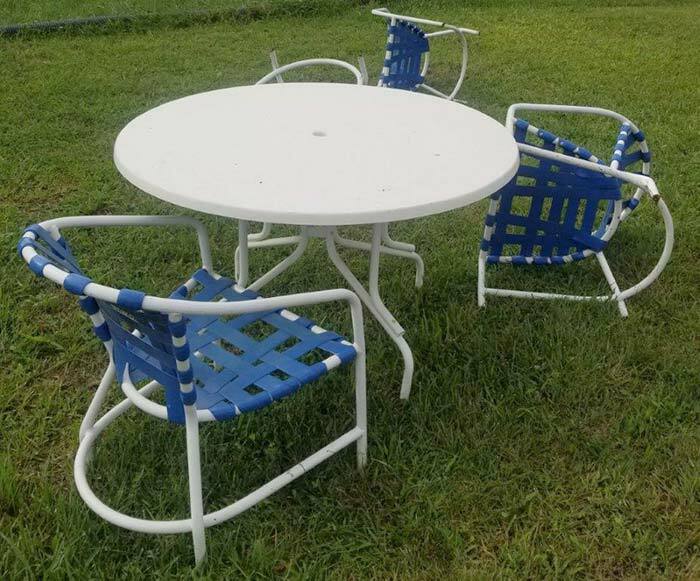 Lighter weighted aluminum chairs can be given more steadiness in high winds by stacking them. A stack of chairs resting in the corner of your patio is less likely to take flight than individual chairs. Another great option is to plant shrubs or trees to help block the wind from your outdoor furniture. This won’t block the wind completely but it will lessen the effects of harsh winds, diminishing its force once it breaks through your wall of shrubbery. Trees are good as a windbreak but be aware you may have broken branches to deal with. Monitoring the health of your trees is equally important to keep an aging tree from falling on your outdoor furniture set. If this does happen, don’t consider your furniture a complete loss. Often your insurance company will cover the cost of repairs. 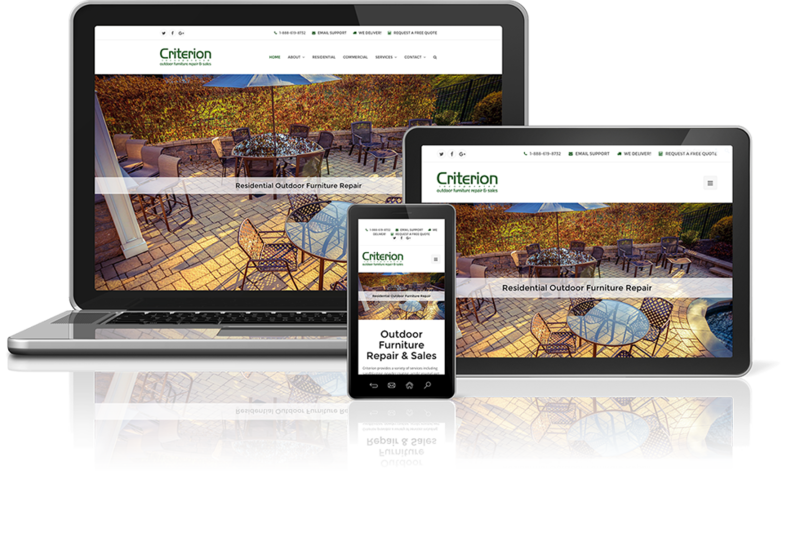 Criterion provides frame straightening, weld repairs and powder coating to restore your favorite furniture pieces back to their original luster. Don’t trash the item before getting an estimate for repair. The most common patio piece blown away or broken in high winds is the umbrella. We find in general homeowners purchase underweighted umbrella bases. A typical 7’5 ft. umbrella should have a weighted base of at least 50lbs to keep it secured in high winds. Larger umbrellas 9’ – 11’ should have a weighted base of 70 -100lbs. Closing the canopy and securing with a tie is the obvious best solution to keeping an umbrella from taking its last airborne trip to destruction. Equally essential to guarding against wind-blown damage are two features; a supporting tube rising out of the base weight called a stem and the fastener that locks the umbrella pole inside the umbrella base stem. The base weights we recommend have two easy to tighten lock knobs insuring the umbrella is held in place. Offset Cantilevers require varied weighted bases some up to 400 lbs. Always read the manufacturer recommendations before purchasing the base. We recommend getting the advice of a knowledgeable outdoor furniture retailer such as Watson’s Fireplace and Patio in Lutherville MD. 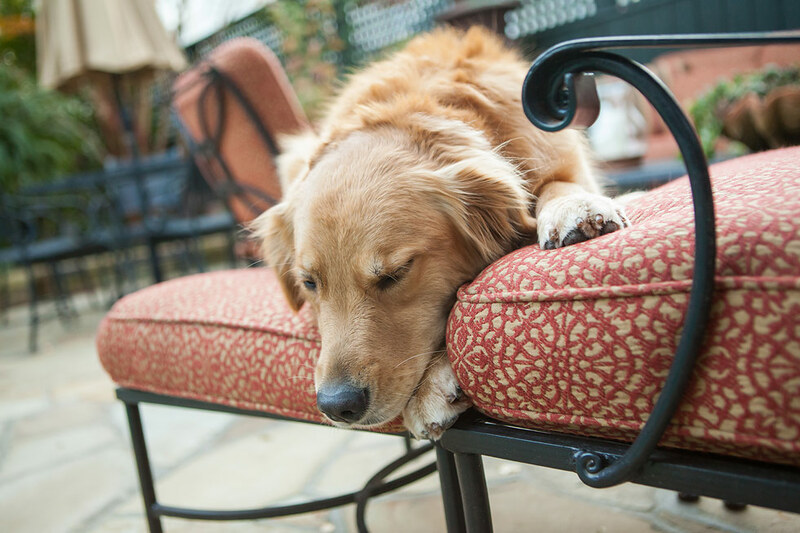 If you have the room, bring your outdoor furniture indoors for ultimate protection. Enjoy the extra seating space until the storms pass.